When I started the movie part of my challenge I wasn’t too excited to see the movie Titanic on the list. Don’t get me wrong, the first time I saw it, I enjoyed the film. However, over the years, I grew tired of the movie. It always seemed to be on TV, except of course when I wanted to watch it for my challenge. Also, the Celine Dion song, “My Heart Will Go On” was always on the radio, in shopping malls, elevators, and the dentist office. I was over the movie. I set these feelings aside and tracked down a copy of the movie at my local Blockbuster. The movie came out in 1997. James Cameron, wrote, directed, co-produced, and co-edited the film. It was nominated for fourteen Academy Awards and won eleven, including Best Picture and Best Director. For years it was the highest-grossing film. Then Cameron released Avatar in 2010, which beat his previous record. Please note that there are some spoilers below. The story is a fictionalized account of a love story. When Jack Dawson (Leonardo DiCaprio) wins a ticket on Titanic while playing poker he feels like the luckiest man in the world. He meets Rose (Kate Winslet). Rose is engaged to a powerful and wealthy man (Billy Zane). She is out of Jack’s league. However, against all the odds, they fall in love. Their love isn’t the only ill-fated part of the voyage. I hope I don’t ruin the story for you, but the ship sinks. I knew this going in the first time. And I knew this going in last week when I popped it into my DVD player. What amazed me about the movie this last time was that I still got sucked into the story. After all of these years, the love story is still touching. I won’t ruin the movie completely for you, but at the end, I had tears in my eyes. And when the credits were rolling, I listened to the song one more time. If you haven’t seen this film, and I’m amazed if you haven’t seen even bits of it, I would recommend it. I think there was a reason why this film was so successful. I think there is a romantic in most of us. And I believe a lot of us love to cheer on the underdog. I wonder if this will be the last time I watch it. Up next is the silent film Sunrise. This entry was posted in Movies and tagged Academy Awards, AFI, American Film Institute, Avatar, Billy Zane, Blockbuster, Celine Dion, James Cameron, Kate Winslet, Leonardo DiCaprio, Movie Reviews, Movies, My Heart Will Go On, Titanic. Bookmark the permalink. I think this is the one film, we do not mind watching 100 times, because the depth of the love and chemistry between the lead cast where very hard to find in other movie. And I guess in Romantic movies I like Titanic a lot and ‘If only’ is not far away 🙂 . I was not a huge fan of Avatar. I thought the 3D effects were cool, but I found the story lacking any real depth. I can see why so many people loved it, but I wanted more…great special effects with a great story. Titanic is a movie for romantics that’s for sure. Every time I have watched this film, I need to have the tissue box near. And the acting is excellent. I am a big fan of both Winslet and DiCaprio. Their acting does add a specialness to this film. And yes, please have tissues when you watch it. I am still sad that DiCaprio never got an oscar for his work in this film. I felt he did an excellent job. I love your film project. A silent one next? I need to do something like that. I’m watching all of the top 100 movies on the American Film Institute list. I haven’t watched too many silent films so it will be interesting. The Great Great Movie Ever….!!! I forgot the place where I was until the movie ended…& it was 2:30 am, me on dining table with the dinner plate intact. You must have liked it!!!!!!! Did you guys know the movie is coming out again in 3D? This movie also made me cry. I had heard…I’m not a huge fan of 3D though since it gives me headaches. But this one might be good in 3D. There are a lot of action sequences. I’m not sure how they can make a film 3D when it was definitely shot, years ago, in two. I’m generally not a huge fan of 3D but I am really doubtful when they’re re-releasing a movie and changing this aspect. I won’t be so close-minded that if it’s great I refuse to enjoy it, but I am skeptical. I don’t understand the process either, but I think they’ve done it with a few other films. I would hope that Cameron, the 3D guy, would know how to do it. But, to be honest, it just seems like a way to make more money and not try to create a whole new movie. Maybe I’m too cynical. It might be mind-blowing. Who knows. I think we hold the same opinion. If it’s good I’ll be the first to admit it, but it looks like a money-grab and kind of a lame tool to do so. I’m with you. I hope it is a good experience for those who go. The reviews should be out shortly. I very curious what people think about it. I’m so glad this movie made your list. It’s a small glimpse into the life (even if fictional) aboard the Titanic. The timing seems so appropriate as we near the 100th anniversary of Titanic sinking… I just watched this several times on HBO. Great post.. Thanks! I didn’t even realize that the 100th anniversary is coming up. April 15th I think. Thanks for pointing that out! It is a pretty good film and you can watch it over and over. I think my experience proved that. Have a wonderful day Nia! The biggest, yet not-so-obvious faus pas in that movie was how at one point we see Kate’s rich boyfriend showing off his recent purchase of Picasso paintings. Every single one of them is known to us viewers as famous, well known and in various museums around the world. Soooooo, if the great ship went down and everything in it, how did . . . . ? Yes, I’m a fan of this film. The plot is secondary to the main point, which is to conduct us through every single important room onboard–a virtual tour of what none of us had ever been privileged to see before. And in that sense alone it is a treasure. However, even after my first viewing I felt I never wanted to hear the name ‘Jack’ again in my life, and particularly not screamed every 10 seconds. Am I ready to see it a second time?……mmmmmm, maybe once was enough. But I’m glad for this posting! It was fun going on a virtual tour of the ship. As a history person, that is one of my favorite parts. Also, I didn’t notice or it didn’t bother me at the time, but I read your comment about the name ‘Jack’ I instantly heard Winslet’s voice in my head shouting it. thank you, TB, for posting this interesting review. Not gonna lie, this film was way too depressing for me. I don’t do well with sad movies. 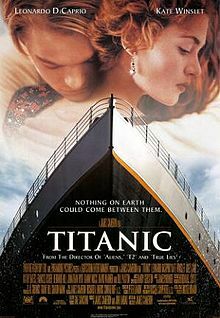 Oddly enough, I can read books about the Titanic without a problem, but seeing the movie was just too much. I have that problem with World War II movies. I have such a hard time watching them and yet I’ve read countless novels, books, and firsthand accounts. I totally get it…and I’m not going to lie, Titanic is sad. This is one I have seen several times also, but I’m like you, I feel like I’ve overseen it. However, there are some movies I can watch over and over and over again. I think the hype around the movie and James Cameron also annoyed me. Once I settled into the film again last week I like it. But it doesn’t compare to my favorite movies like Bringing Up Baby. I can watch that a thousand times. I only watched it for the effect’s originally, over time and repeated viewings I’ve grown to like the love story too, even though it is contrived! It is hard not to cheer for Jack and Rose. It must be the romantic in me and you. I did enjoy the effects and I saw the movie in the theater the first time and really enjoyed it. I’ve never seen it! I believe I’ve seen little bits but that’s it! Everyone thinks I’m either crazy or joking when I tell them I haven’t seen it! I want to go see it when it comes out in theatres in 3D so I can finally say I’ve seen it! Wow! That is amazing. I can’t wait to hear what you think of it when you finally see it. No reason to feel silly. Sunrise was made in 1927 and there is no talking in the picture. It was made before they developed the technology to record the actors speaking. Instead there is just music (so it isn’t completely silent) and subtitles. When I saw it, I was amazed at how good it was too!! Great blog! It really is a good film. One might expect it to be just about the special effects, but it has so much more to it. Spoiler! The ship sinks?! 😛 They are bringing it out in 3D at my cinema next week. I don’t know who would go see it but.? LOL…I wasn’t going to include the spoiler alert, but I thought just to be safe. I didn’t want to ruin any part of the movie 🙂 Are they just showing it in 3D? Whenever they offered 3D movies I would try to see it in 2D. Of course some of them you had to see in 3D like Avatar. But I hate paying the extra money to get a headache watching it in 3D. I think I only fully watch this movie once…after that, I only watch the last part because I enjoy the visual effect. Talking about Celine’s song…that is the one song by her which makes me terribly bored. Just like you’ve said, it was EVERYWHERE!! I know…it seemed like for years I could not escape that song. The special effects at the end of the movie are pretty impressive. I wonder what it would like like if he made it today. I have also just watched Titanic fairly recently with my ten year old daughter. It’s great revisiting so many films and seeing them through their eyes. Watching Titanic was pretty deliberate on our part since there was also an ongoing Titanic artifact exhibition going on in one of the bigger museums here in Singapore and watching the film would at least give my daughter a rough idea on what she should expect. I remembered laughing out loud since she seemed extremely exasperated with Rose especially towards the end. But you’re right, it’s an entertaining flick. I think it’s funny that your daughter got frustrated with Rose because I did as well. Maybe the first time I watched it, I thought her actions were more romantic. But this time I was like, what are you doing. That is pretty cool about the Titanic exhibit. I think the movie is a great introduction into the disaster. LOVE the film, HATE the director! Cameron makes me ashamed to hail from the Niagara region!